IRVING, Texas (AP) — The Boy Scouts of America put off a decision Wednesday on whether to lift its ban on gay members and leaders, saying the question will be taken up at the organization's national meeting in May. "After careful consideration and extensive dialogue within the Scouting family, along with comments from those outside the organization, the volunteer officers of the Boy Scouts of America's National Executive Board concluded that due to the complexity of this issue, the organization needs time for a more deliberate review of its membership policy," Deron Smith, the BSA director of public relations, said in a statement. Smith said the organization's national executive board will prepare a resolution for the 1,400 voting members of the national council to consider. The annual meeting will take place in May, 2013, in Grapevine, Texas. Walking to his car after the delay was announced, board member Jack Furst had very little to say. "It's all good," Furst told The Associated Press before driving away. The BSA announced last week it was considering allowing troops to decide whether to allow gay membership. 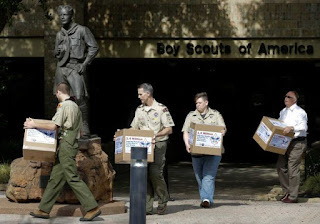 That news has placed a spotlight on executive board meetings that began Monday in Irving, Texas, where scouting headquarters is located. Smith said last week that the board could take a vote Wednesday or decide to discuss the policy, but that the organization would issue a statement either way. Otherwise, the board has remained silent, with reporters barred from the hotel where its meetings are taking place. At nearby BSA headquarters, a handful of Scouts and leaders delivered petitions Monday in support of letting gay members join. The conservative group Texas Values, meanwhile, had organized a Wednesday morning prayer vigil urging the Scouts to keep their policy the same. "My attitude is that gays and lesbians should have access and opportunity the same way everybody else does in every institution and walk of life," said Obama, who as U.S. president is the honorary president of BSA, in a Sunday interview with CBS. Perry, the author of the book "On My Honor: Why the American Values of the Boy Scouts Are Worth Fighting For," said in a speech Saturday that "to have popular culture impact 100 years of their standards is inappropriate." The board faces several choices, none of which is likely to quell controversy. Standing pat would go against the public wishes of two high-profile board members — Ernst & Young CEO James Turley and AT&T Inc. CEO Randall Stephenson — who run companies with nondiscrimination policies and have said they would work from within to change the Scouts' policy.